It is always a struggle to find electrical power for Mustangs. Most people will come off the back of the key for power but if you have enough components that need high current, you WILL have problems with burning wires. Best thing to do is create circuits that run off of relays and are fused to protect the wiring and components. They come in different contact ratings, with 25 and 40 amps being the most common. You just need to be careful not to connect things that will draw more current than the relay can handle. 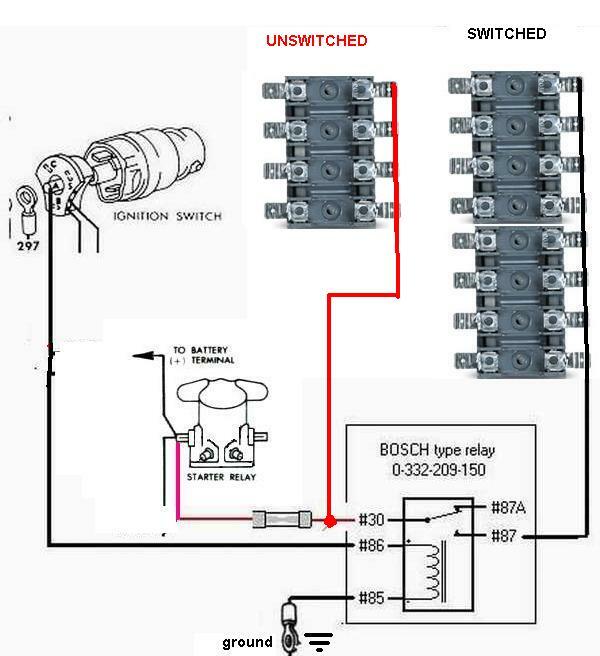 The fuse going to the #30 contact is located close to the starter relay. This is to protect the wiring going to the relay in case it should short out. All of the fused terminals will become "hot" when you turn on the key to the ON position. The wiring to the relay from the starter relay should be large enough to handle the current of all the circuits you expect to need. Larger is better.